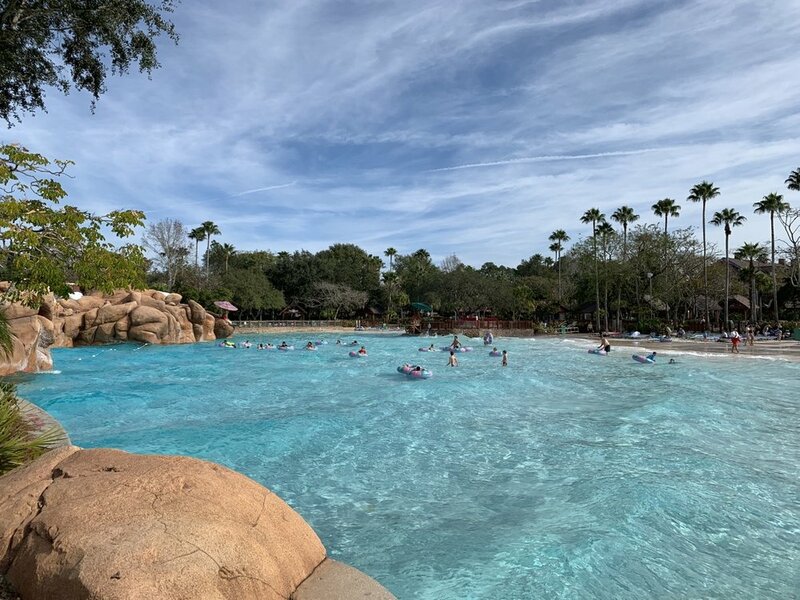 In this post, we cover everything you need to know about Disney’s Blizzard Beach Water Park, one of two Disney-operated water parks at Walt Disney World. We start with some basics, including theme, if/when/how to visit, crowds, and weather. From there, we get to the heart of things—our Blizzard Beach Rides Guide, Rides Ranking, and One-Day Itinerary. Then we cover food & drink and up-charges at Blizzard Beach. We close with a lengthy discussion of prices and ticket options. We save that for last because it’s detailed, but really dry and not relevant to everyone. Before we go on, you should know that much of this post is identical to our Typhoon Lagoon guide. Obviously things like rides, restaurants, and itineraries change, but our general planning tips are going to be the same for both water parks. If you’d like to see the parks compared, we have a post comparing Blizzard Beach vs. Typhoon Lagoon. Blizzard Beach is one of two Disney-operated water parks at Walt Disney World (the other is Typhoon Lagoon). It is located near Animal Kingdom and the All-Star Resorts. Blizzard Beach has twelve attractions, eight restaurants / snack stands / bars, and one store. Blizzard Beach is not included as an option on standard one park per day tickets or Disney World park hopper tickets—those only work at the four theme parks. It is included on park hopper plus tickets. The water parks also sell one-day tickets (Adult - $73.49, Child - $67.10) that allow access to both parks and annual passes. The water parks are included only in the highest level of Disney World annual pass—the platinum plus pass. We cover ticket options in detail at the very end of this post. We weren’t blown away by the theming Blizzard Beach, particularly when compared to Typhoon Lagoon. Part of the problem is just that the fake snow looks really fake (there’s no good way to make permanent fake snow), and it starts to get old. It does have an instant “Wow!” factor, it just fades quickly. Things are better if you look past the snow. This isn’t just a snowy area turned water park—it’s a ski lodge turned water park. To that end, the use of the lodge architecture throughout the park is pretty cool. The rides also make good use of the theme, transforming different snow sport concepts in water rides. 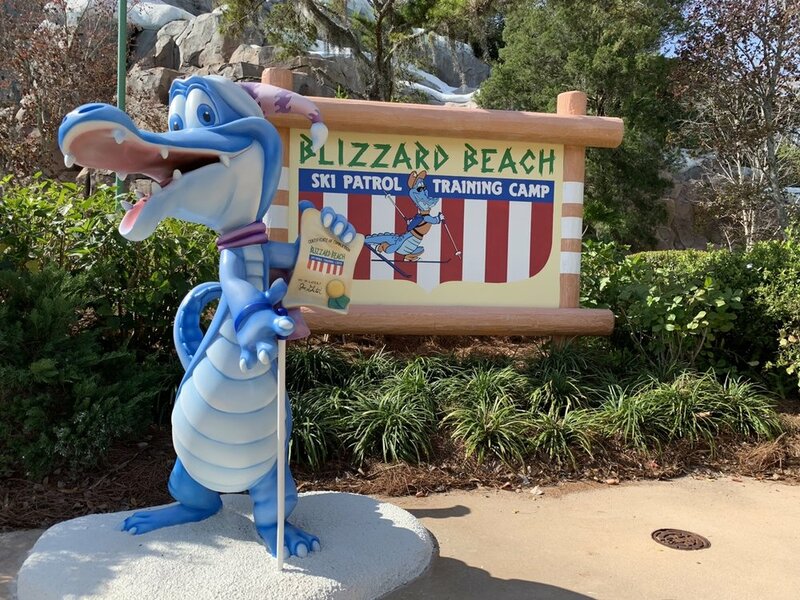 Blizzard Beach’s mascot is “Ice Gator,” though he doesn’t figure particularly prominently in the park. Like Typhoon Lagoon, Blizzard beach has essentially a circular layout. The focal point of the park is Mount Gushmore, which houses most of the slides. Around (roughly) the outer perimeter is the lazy river, Cross Country Creek. When you arrive, you’ll be in an entrance area east of the rest of the park where you’ll find the main restaurant (Lottawatta Lodge), store (Beach Haus), and towel & locker rental. There are two main bridges connecting the entrance area to the rest of the park. Crossing the northern bridge, the kiddie play area will be to your right, and you’ll immediately encounter the Chairlift ride, which can take you to the top of the Green Slopes (alternatively you can walk). Continuing right (counter clockwise) you’ll encounter pre-teen play area and then the Green Slope collection of rides. Here’s the view from the top of Mount Gushmore, where the Green Slope rides begin. Passing in front of Mount Gushmore, you’ll hit the Purple Slope rides next. Here’s a view of those from the top of Mount Gushmore. The Red Slope slides are sort of hidden behind the Purple and Green Slopes. You can reach the Red Slopes from either side of the park by going around behind Mount Gushmore. Past the rides, in the the southeast corner of the park, you’ll arrive at Melt-Away Bay, the beach area and wave pool. Behind it, to the east, is the second bridge that connects you back to the entrance area by Lottawatta Lodge. One lap around the park takes around 15 minutes. Both of Disney World’s water parks operate on a seasonal schedule with a lengthy refurbishment period during colder weather. Weather permitting, every day of the year has at least one park open, and both are open from (roughly) March through October. In 2019, Blizzard Beach is expected to close in late October and be closed until early January 2020, but exact dates have not yet been posted. It is always possible Disney could stagger the water park closures differently next season, but we’d always expect at least one water park to be open. Because all attractions are outside, thunderstorms grind the entire operation to a halt. Conversely, rain slows nothing down and the park will operate in a downpour. Disney’s water parks—ironically in the case of Blizzard Beach—do shut down for cold weather. Usually “cold” means something like highs in the 50s or lower. This is mostly only a problem from November through February, and it usually happens no more than a few days a year. The water park hours at Disney World vary by season. During colder months, the standard is short days of 10AM to 5PM. Longer days of 10AM to 8PM happen during the summer months. We’ve heard of earlier opens and Extra Magic Hours, but we haven’t seen them recently. For the most part, hours and crowds level out so you won’t have high crowds and a short day. Memorial Day and Easter week are exceptions, when crowds might be high but hours still limited to seven or eight-hour days. Should You Visit Blizzard Beach? For most guests, we would say Blizzard Beach is a “bonus” or “extra day” activity, not a must-do. If you have park hopper plus tickets and want a day off from the grind of touring Disney’s theme parks, visiting Blizzard Beach is a good option. Arrive at open if you want to get on everything with no wait, arrive midday if you’re fine seeing whatever has no wait. Basically, it’s a good alternative to a resort day. If you’re a first-time visitor, don’t think about Blizzard Beach unless your trip is six days or more. We think five days are very well spent at the theme parks instead. Obviously, if you’re a water park enthusiast, you might want to make an exception. That said, if you’re such an enthusiast, you probably need to be looking at Universal’s nearby Volcano Bay as an alternative. Do you need a full day at Blizzard Beach? You definitely do not need a full day at Blizzard Beach if you just want to experience what it has to offer and take an hour or two to relax. You can easily experience the entire park in a few hours if you arrive at open. If both water parks are open for, say, 10 hours, you can probably experience everything offered by both in a single day (the water park ticket covers both water parks) except on the busiest days. We remind you first that we can’t predict the future of crowds. Moreso than the theme parks, crowds at the water parks are very weather-dependent. If the most beautiful day of a January week occurs on a Saturday, your crowds might be higher than anticipated. If you’re looking for overall predictions of Disney World crowds, we have a post dedicated to Disney World crowd calendars. 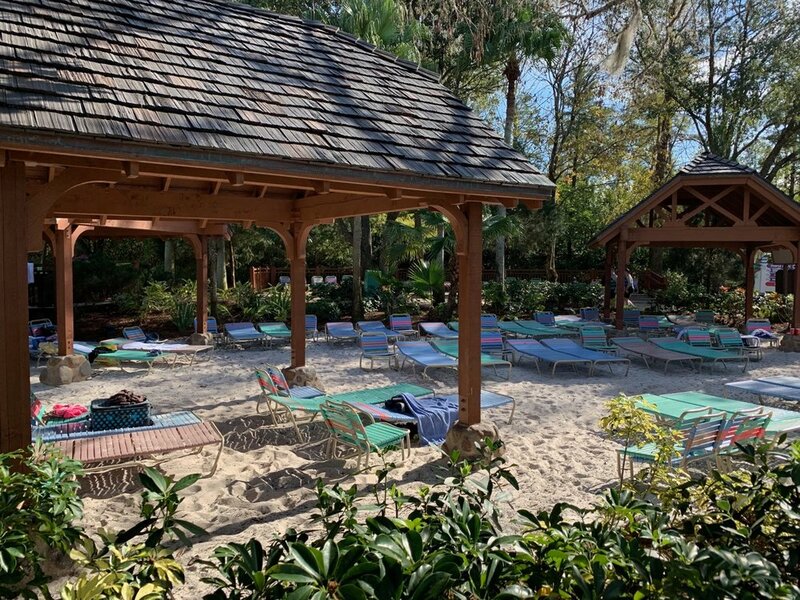 Crowds aren’t really something you need to plan for at Blizzard Beach, except that you should just always plan to arrive at open to maximize your chance at getting a seat in the shade and getting your first trip on the rides done as quickly as possible. Generally, crowds are worst from April through July. Waits of 15+ minutes at Blizzard Beach happen during this period. Waits of 30+ minutes can happen, but are rare. The bigger problem with crowds is that they take all the best seats. In any case, this isn’t like one of the main four theme parks. If you arrive early to Blizzard Beach, you’ll have an easy time getting on every ride. If you arrive midday, you may need to wait a few minutes for the popular rides, but you’ll still get everything done. Off-season crowds, particularly on cool days, are non-existent. On a recent visit in January, we were done with all the slides (okay, we saved one for the afternoon, but we could have fit it in) by 11AM following a 10AM open. We want to quickly note two Disney park features missing from Blizzard Beach. First, there is no FastPass+ at Blizzard Beach—you’ll need to wait standby for any rides. Second, there are no ride photographs or Photopass photographers at Blizzard Beach. Guests at Disney hotels get the perk of Disney transport access. Unfortunately, Disney isn’t so big into getting guests directly to the water parks, especially during off-season. The water parks often require either a transfer or a shared bus. Getting to Blizzard Beach via Disney transport usually requires either a stop or transfer at Animal Kingdom. Update: Disney is expected to have dedicated bus service between hotels and the water parks beginning March 17, 2019. Blizzard Beach does have free parking, so driving is a great option. Personally, with its limited hours, we’ll probably always take an Uber to Blizzard Beach unless the hotel concierge confirms a direct bus is operating (during summer). Don’t waste time with transfers and stops, just take an Uber (or, if you must, a Minnie Van). In the past, Disney has tested a bus between Typhoon Lagoon and Blizzard Beach for water park hoppers (both are included on a single ticket). This service does not appear to be offered anymore, but it’s always worth checking with guest services. Disney could surely re-introduce the route on a moment’s notice. Blizzard Beach has seven water slide rides, one chairlift ride, one kiddie play area, one pre-teen play area, a lazy river, and a wave pool. The seven slides are broken up into three areas—Green Slopes (3 slides), Purple Slopes (3 slides), and Red Slopes (1 attraction with 3 slides). The groups don’t really mean anything other than location, so they’ll just come into play in the itinerary section. In this section, we provide our reviews and (for some rides) ranking of the rides. In the following section, we have an itinerary / touring plan that tells you the order to get through them. For each ride, we also provide the type, height requirements, other requirements, and location. We’re going to start with the main seven water slides at Blizzard Beach. These are the only attractions we rank—not because they’re better than the remaining attractions, but because it’s silly to compare a water slide to a lazy river or chairlift. Then we cover the other three main attractions, followed by the two play areas. Summit Plummet is the tallest, fastest and centerpiece ride at Blizzard Beach, so it’s no surprise that it’s also the best ride. With a 120-foot drop, it’s the third-tallest and fastest free fall slide in the world. From the top of the ride, you’re treated to 360-degree views of Walt Disney World, including all four park icons. And coming from that birds-eye view, pushing yourself off that ledge to start the ride is nothing short of terrifying. You proceed to drop nearly straight down twelve stories, much of which is open air. The best thing about this ride, compared to other similar rides, is that it angles out gradually, which makes for a pleasant landing. All in all, it’s a great thrill ride. Just next door to Summit Plummet on the Green Slopes is Slush Gusher. It’s another body slide made up of three shorter drops. Because it’s not as intense of an experience, Slush Gusher allows you to enjoy the ride more. Each drop gets a little bigger and the third almost sends you airborne before coming in for a soft finish. Slush Gusher is a great balance of thrill ride and pleasant waterslide. It also gets bonus points for the great view you get from the top. Hit the mogul slopes as you take off face-first down this zigging and zagging ski slope. This ride is great because this same track would typically be a tube slide, but the switch to a face-first mat ride really makes it stand out. It’s really fast and zippy, and is definitely the most fun ride without a height requirement. Runoff Rapids comprises three slides, one enclosed and two open. All three slides follow roughly the same track, and are a few of the longest ride times in the park. It’s a classic tube slide with lots of dips, sharp turns, and a few bumps and splashes throughout. If this ride was a little faster, it might even be ranked one spot higher. It’s a really enjoyable waterslide. The two open slides are better than the enclosed one, and they are the slides that really earned its rank. The enclosed slide is really dark, and for such a long ride, gets a little claustrophobic. It was also really steamy in there on a 70-degree winter day, I can’t imagine how warm it’d be in Florida summer. Grab your friends and race face-first down the slopes! Up to eight racers can slide at a time and the lifeguards countdown to the start of each race. This slide is one of two slides in the park that incorporates competition into the attraction and in our opinion, does it best. The biggest issue with this ride is that it’s really difficult, especially for adults, to kick off to start this ride. Even as an average-weight 5’3” adult female, I really struggled to kickoff. Watching more riders struggler, it became clear that I wasn’t the only one. I think they need more water pressure at the top of this slide, but otherwise it’s a great attraction. The fact that this ride is number six really speaks to the quality of attractions at Blizzard Beach. This is a great ride! It’s another competitive slide where two riders can race down a “double-dipper”, mostly enclosed slide. It’s really fast and supper fun, and riders (especially the lightweight ones) will zip across the water well after the slide ends. When we were there, this slide had the longest wait time (as in the only ride in the whole park that had a wait this day). The only reason we have this ride ranked so low is that it’s just too short. Teamboat Springs is a fine ride, maybe even a good ride as far as raft rides go, but it just can’t compete with the other great slides in this park. It’s weirdly placed and spits out riders in an awkward corner of the park. It also feels like they built the ride and then realized the ride ended 20 yards short of the ride exit. You just sort of float lazy river style for a while at the end of the ride until you can disembark. It’s better than other raft rides at Disney, but still a boring ride experience. Now that we’ve ranked the slides, let’s discuss the rest of the attractions. The Chairlift is a great bonus attraction at Blizzard Beach, and it carries the ski-town theme a long way. It’s a really fun alternative to climbing all the stairs to the start of Teamboat Springs and Slush Gusher (you still a few more to climb if you’re visiting Summit Plummet). As far as lazy rivers go, Cross Country Creek is average. It has a few standout elements, like a cave that cuts through Mount Gushmore and Ice Gator’s cabin, but it’s otherwise an average float through a waterpark. It’s a long lazy river, clocking in at over 28 minutes and has seven entrances around the park. The wave pool at Blizzard Beach is “made” from ice-melt from nearby Mount Gushmore. Unlike Typhoon Lagoon’s Surf Pool, this pool is 100% small, “bobbing” waves. Bobbing waves are leisurely and ongoing waves for playing around in. This maybe makes it better for small kids, who can enjoy the entire pool all day. Obviously if you’re a fan of conquering the huge waves, the Blizzard Beach wave pool might disappoint. I lasted about 30 seconds floating in a tube before I got motion sick and resorted to jumping around in the waves float-free. This wave pool doesn’t offer anything special, but it’s a fine place to spend a half hour. Before we get to the two play areas, we want to highlight an unlisted attraction—Mount Gushmore. All seven main slides start somewhere on Mount Gushmore, and the Chairlift ends atop it, so you can’t completely miss it. However, we really recommend you take the time to walk it from one side to the other. If you just zip up and hop in line for rides, you’re missing a chance to take things in, particularly views. The only “hidden” thing is the Observation Deck, which isn’t listed on the map. It’s worth taking a trip up (via the Green Slopes side) and down (via the Purple Slopes side) the mountain just to take it in, visit the Observation Deck, and enjoy the views. Tike’s Peak is the kiddie (under 48 in. / 122 cm) play area at Blizzard Beach. It has various water features and small fountains. Scroll through the below pics for a better sense of the area. Ski Patrol Training Camp is another play area at Blizzard Beach geared toward pre-teens rather than particularly small children. There are three small slide attractions, one small zip line, a small ropes course feature, and space for swimming. There’s really no situation where you can’t ride every Blizzard Beach ride in a single day. It might not be worth it to get every single slide (some rides have multiple slides), but visiting every attraction is easy. If at all possible, we recommend arriving for open. Even on busy days, few people arrive for open, and you’ll have your run of the park for an hour, which is all you really need to knock out a huge chunk of rides. Turnstiles to Blizzard Beach open 15 minutes to 30 minutes before scheduled open, and an inner ropes at the two bridges over Cross Country Creek occur at the opening time. We’re not familiar with peak season rope drop, but we assume it’s the same as Blizzard Beach really never has morning crowds. Don’t worry if you’re not arriving for rope drop. We know many people will be arriving midday, so this section offers alternative plans for you that mostly only matter during the busiest days. On ordinary days, you can follow the same plan as those who arrive at open. If you arrive in the morning, start by finding a spot that will be in the shade (i.e. has an umbrella or other coverage) to lay down your towels. If you have small children (under 48 in. / 122 cm), you’ll want to head straight north from the entrance area, without crossing Cross Country Creek, past Frostbite Freddy’s and into Tike’s Peak, the play area for kids 48 in. and under. If you have kids between 48 in. and…teenage years (Disney doesn’t really have a clear cutoff), you’ll want to consider going a little more toward the Green Slopes into Ski Patrol Training Camp, which is full of small attractions geared toward pre-teens. Otherwise, you have your pick of views. Anything along Melt-Away Bay is great, and you can find more secluded seating all the way back by Red Slopes, but you’ll be better off moving back there later rather than heading there to start your day. Then go grab a locker (if needed—$10 small, $15 large, full day use, right by Frostbite Freddy’s) before you start getting through the ride (which we cover next). Alternatively, you can grab a locker if you get there with some time to spare before rope drop. Note: We’ve never used a locker at the water parks, and we’ve never had anything stolen. I’ve even left my laptop in my bag on my chair. Would I recommend this—no! I’m a lawyer by trade—I know better than to suggest you leave your stuff out! But we always try to give practical, honest tips about how we do the parks, and we have always skipped out on lockers. Remember, you’re typically looking at 5 to 15 minute waits at Blizzard Beach. During midday on nice, summer days or spring break season, you’ll get up to 30 minutes. The most efficient way to visit the attractions is by proceeding counter-clockwise around the park and hitting them roughly in geographic order. But if you start your rides at the peak of the day from 11AM to 2PM, head up the Green Slopes and consider starting with Teamboat Springs if the Summit Plummer and Slush Gusher lines are long. Then come back for those two as crowds thin out into the afternoon. After you’re done with the rides, sit back and enjoy the play areas, wave pool, and lazy river. Food and Drink options are more limited at Blizzard Beach than at Typhoon Lagoon. There is one main quick service restaurant, three smaller quick service stands, two snack / ice cream stands, and two bars. There are also two Joffrey’s Coffee stands. One is next to Lottawatta Lodge near the lazy river. The other is at the north end of Melt-Away Bay. All the food options at Blizzard Beach are quick service restaurants for those on a Disney dining plan or smaller stands that don’t take the dining plan. There are no table service restaurants. Several restaurants and bars are seasonal and will be closed outside of summer. We’ll refer to those that are not seasonal as “year-round” even though the park itself is not open year-round. One final note, there are beverage refill stations throughout the park, but these do not work with Disney hotel mugs. Instead, you either need to (1) purchase a new mug for $11.99 (one day of use) or (2) reactivate an old mug for $8.50 (one day of use). The mugs work at both water parks and your one day covers use at both parks. Lottawatta Lodge is the main quick service restaurant at Blizzard Beach, but its menu isn’t much more impressive than the other options, with only six items (plus vegetarian alternatives). The full menu is available here. If you’re looking for the quick service option, Lottawatta Lodge is the go-to, more because of its extensive seating than its relatively limited menu. Lottawatta Lodge is located in the entrance area across from Beach Haus and right in front of you as you enter the park. There are two smaller snack stands in this area, which we’ll cover next. Frostbite Freddy’s is another quick service stand (with limited options) right by the main restrooms / changing rooms. They also serve adult beverages, particularly of the frozen variety. The full menu is available here. Frostbite Freddy’s does not participate in the Disney Dining Plan. The next two spots we’ll discuss are sort of quick service “outposts” in the other areas of the park. Both participate in the dining plan as quick service restaurants, and both have decent menus. Avalunch is the small quick service option at the north end of the park, over by the Chairlift, Green Slopes, and Ski Patrol Training Camp. It specializes in hot dogs, but the full menu is available here. The Warming Hut is the small quick service option at the south end of the park. It specializes in non-beef items (turkey, tuna, chicken), and the full menu is available here. The Polar Pub is a bar, with a good amount of seating, in the middle of the beach at Melt-Away Bay. Arctic Expeditions is a seasonal bar (no seating) across from Avalunch. I.C. Expeditions is a seasonal ice cream stand also near Avalunch. 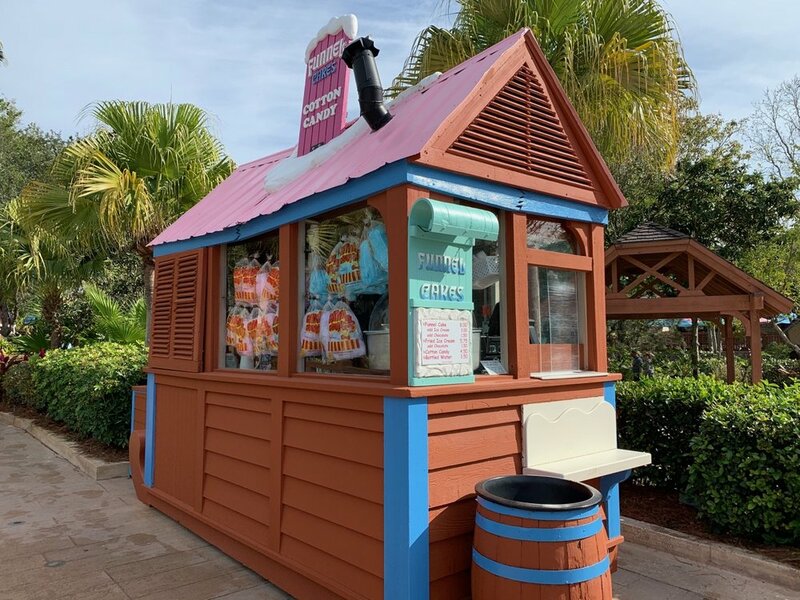 There’s an unnamed and unlisted funnel cake and cotton candy stand next to the Melt-Away Bay Joffrey’s. Blizzard Beach has two premium seating options. Lodge Umbrellas are a simpler option, consisting of shaded seating for four people, plus towels and a table. These cost under $100. To inquire about these options, call (407) WDW-PLAY in advance (preferred) or visit Beach Haus when you arrive. Honestly, there’s no way we’d ever recommend a first timer book these options. That’s not to say you shouldn’t—I’m not going to tell you how to spend your money. But if you arrive at open, you’ll have your choice of free seats. We saved this for last because there’s a lot of boring math involved (seriously). In general, we wouldn’t recommend you plan your tickets around the water parks. Figure out what ticket option (one per day, park hopper, or park hopper plus) you want for the four theme parks, and then add on the water parks in the cheapest way possible, either by adding water park tickets or by upgrading to park hopper plus. The Disney World water parks both have standard pricing of one day tickets at: Adult - $73.49, Child - $67.10 (those prices include tax). You can get a $6 discount by purchasing a ticket with blockout dates. Blockout dates for 2019 are May 25 – August 25. We recommend checking Orlando Fun Tickets and other discount Disney World ticket brokers to see if discounts are available. Disney offers a water park annual pass for $148.04 (all ages 3+). This pass covers every day of the year. It doesn’t come with any other pass benefits. We’ll leave to you to analyze whether it’s worth it (it’s just over 2X the price of the adult single day ticket, in case you missed that). Standard one-park-per-day tickets do not include the water parks. If you buy those tickets, you’ll need to purchase a separate water park ticket. Park hopper tickets without park hopper plus also do not include the water parks. The only tickets that include both theme parks and water parks are (1) platinum plus annual passes and (2) park hopper plus tickets, which allow you one visit per day to your choice of: Typhoon Lagoon, Blizzard Beach Water Park, Winter Summerland Miniature Golf Course, Fantasia Gardens Miniature Golf Course, Oak Trail Golf Course, and ESPN Wide World of Sports Complex (I still have no idea what you do there). If you’re planing a vacation, you’ll need to consider whether you want to buy park hopper plus tickets OR a lesser ticket (like one-park-per day or park hopper) WITH a single-day water park ticket. We’re going to look at a sample June vacation to run some numbers, using just a single adult and Undercover Tourist pricing for simplicity. Let’s say you’re looking at a five-day trip starting June 15. If you bought a four-day (one park per day) ticket and a single day water park ticket, you’d spend $439.11+$73.49 = $512.60. That’s five days, one visit to each park and a water park day. If you purchased a four-day park hopper (no water parks) and a single day water park ticket, you’d spend $516.55+$73.49 = $590.04. That’s four days of theme park hopping and one water park day. And if you bought a five-day park hopper plus (includes water parks), you’d spend $544.41. Just for comparison, a five-day park hopper ticket (no water parks) would run you $520.50, and a five-day one-park-per-day ticket would run you $457.54. Obviously, if you’re seriously considering a water park and you’ve already decided to get park hopper tickets, it makes sense to make the leap to park hopper plus. But if you have decided against park hopper, it will probably make more sense to buy a separate water park ticket. You could even buy a five-day, one-park-per-day tickets and add a water park ticket for a total of $531.03, still $13 less than if you went all the way up to park hopper plus. With that ticket, you could visit a theme park before or after you went to the water park. As we’re fans of park hopper, we’re always going to advise getting park hopper plus if you’re interested in the water parks, but it’s helpful to run the numbers and consider your specific situation. What if you’re visiting both water parks? If you’re visiting for six days and want to visit both parks, park hopper plus is best. We’ll spare you the verbose analysis from above. Remember, a water park annual pass is the cost of two water park tickets. Here’s the numbers with that same sample June 15 date. Note, finally, that the one-day ticket does allow for entry to both water parks in a single day. So you could visit both water parks in a single day just by adding a one-day water park ticket to any theme park ticket. Do you have any questions about Blizzard Beach?